It may surprise those who are familiar with the large side of the present Mr. Ben­nett's career to know that not only is he not a college-bred man, but. that his edu­cation was irregular and scant. He is a brilliant linguist and has a good knowl­edge of history, but he is surprisingly de­void of academic learning. His father's ambition was to develop in him the practi­cal instincts of journalism. Long before the elder Bennett died he made his son the absolute owner of the "Herald." This fact was made known a few years ago by Mr. Bennett's lawyer. But before imposing this responsibility upon the young man he allowed him to found and edit the "Evening Telegram." Already the heir of the "Herald" had shown the quality of tem­per that has since made him successful by winning an international race across the Atlantic ocean in his schooner "Henrietta" and by estab­lishing a lead­ership among the young sportsmen of New York, daring any­thing and everything, imperious, generous, scornful of criticism and impatient of restraint - an American Prince Hal, with a hundred Falstaffs in his train. It has been the custom to regard the el­der Bennett as the greater editor of the two. Nothing could be farther from the truth. The father had a genius for politics and was an astute manipulator of political leaders, and in this respect alone he was the superior of the son as a journalist. He had humor, business sagacity, a pene­trating style as an editorial paragraphist, untiring energy and amazing enterprise and keenness in the collection of news. But it was the son who established the interna­tional standing of the "Herald" and gave it a character all its own, and it was he who maintained its supremacy in the teeth of almost incredible competition. In considering Mr. Bennett one naturally thinks of Stanley, whom he sent into Africa to find Livingstone; of the ill-fated "Jean­ette" expedition, which he sent to discover the North Pole; of the soup houses, super­intended by Delmonico, which he opened for the starving poor of New York; of the commercial cable, which he laid across the Atlantic, with the assistance of Mr. Mackay, to destroy the great cable monopoly; of the one hundred thousand dollars which he gave, and the three hundred thousand dol­lars which he raised, to feed the famine­ stricken peasants of Ireland, and to break the effects of Mr. Parnell's agitation in Amer­ica; of the system of transatlantic storm­ warnings which he organized, and of other strokes of brilliant enterprise. But the real key to Mr. Bennett's char­acter as a journalist - and it is only in that capacity that he has a right to distin­guished consideration in his own country - is to be found in his efforts to convert the "Herald" into an impersonal organiza­tion. His one ambition today is that when he dies the "Herald" shall continue - to use his own words - as a sort of head­less republic, which no one man or no one party can control. It was with that idea chiefly in view that he turned the paper into a stock company, capitalized at one hundred thousand dollars. While Mr. Bennett's body has been in Paris, the serious part of his mind has been in New York. It may be that the nag­ging abuse of the American press and the broader, gayer conditions of life in the French capital induced him to leave the land of his birth in the beginning, but he soon discovered that in his library in the Champs Elysees he was free to conduct the "Herald" without the interference of out­side personal pressure. Looking at Ameri­can events and tendencies from a distance of more than three thousand miles, his judgment was cooler. The Europeans of rank and position with whom he associated himself in his recreation - yachting, pigeon­ shooting, horse racing, coaching - were in­terested in the affairs of their own country and had no desire to influence the course of a newspaper in New York. He might ride with the hounds in England, shoot in France, sail the Mediterranean with the Russian grand dukes, drive his coaches over the most picturesque roads of the Riviera or live at ease in his country house at Bougival or Nice, entertaining the liveliest and most interesting men of the Continent, without incurring obligations embarrassing to the "Herald." While Mr. Bennett keeps his newspaper free from direct affiliation with any political party, he is himself a conser­vative Democrat and a consistent opponent of American jingoism. His residence in France has removed him from any tempta­tion to develop political ambitions, so that, in his ripe years, he can look with unprejudiced eyes upon party issues. New Yorkers are familiar with the aggres­sive personality and brilliant caprice which Mr. Bennett displayed in the "Herald" many years ago. He fought Jay Gould with unrelenting ferocity, attempted to destroy the great American News Company by establishing a rival corporation, attacked the Catholic church in bitter editorials and made himself the most abused man of the American press. He laughed at con­ventions and traditions and invariably printed in the "Herald" the worst things his enemies said about him. When John Kelly, the leader of Tammany Hall, pub­licly assailed his private character, Mr. Bennett retorted in a contemptuous editorial: "The proprietor of the Herald lost his reputation long before Mr. Kelly was ever heard of." When Jay Gould gave to the press of New York a letter of ten thousand words attacking his personal life, Mr. Bennett published it in full in the "Herald," with the curt remark that Mr. Gould was "a gentleman." He swung his newspaper from one side to another in public questions with startling abruptness. Time has mellowed and broadened Mr. Bennett. He has withdrawn his name from the editorial page of the "Herald" and eliminated every suggestion of personal journalism from its columns. It has been a difficult feat for such an impetuous and imperious man, unaccustomed to effective opposition or compromise. All this has been a deliberate preparation for the im­personal future of the" Herald'" when he shall have passed away. His genius for organization and discipline has created a machine that will run smoothly without the one man power. Long ago he parted company with the distinguished writers who dominated his editorial page in order that no man's individuality or influence should be too strong. For years he has entrusted the main journalistic management of the "Herald" to Mr. William C. Reick, an able, conscientious and modest editor, who is known to the public simply as the "city editor." The business management and the superior control are in the hands of Mr. Gardiner G. Howland, a silent, conser­vative man, once the friend of Mr. Bennett's boyhood. The sweeping, unexpected changes of staff and of policy are over, and the "Herald" has taken on the independent, conservative and anonymous character which its proprietor expects it to maintain after his death. And yet, in spite of this theory of jour­nalism by council or committee, the incon­trovertible fact remains that the "Herald" has not in thirty years accomplished any­thing of importance or carried out a success­ful policy, in either the editorial or business departments, that was not the direct in­spiration of its proprietor's brain. The success of the "Herald," which has an income of nearly a million dollars a year, is a refutation of Mr. Bennett's own theory of committee journalism and a vindication of the one man principle. James Gordon Bennett is the "Herald" and the "Her­ald" is James Gordon Bennett. It must always be so while he lives. His most striking successes have been usually gained in the face of adverse advice. When he decided to move the "Herald" office up­town and house it in its present Italian palace, his most trusted lieutenants opposed the. plan; yet that was one of the wisest steps he ever took. It is hard to sum up the character of this remarkable American; it is too com­plex and paradoxical. He is by turns in­tensely proud and humbly self-condemna­tory; royally generous and penuriously saving; trustful and jealously suspicious; now displaying the most delicate tact and con­sideration to all who are about him and now breaking out into moods of harsh in­tolerance; today a patriotic, enthusiastic American, tomorrow a critical European, coldly dissecting the qualities of his own country in the Paris edition of the "Her­ald"; one hour a dashing, careless, reck­less sportsman, as hilariously prankful as a boy, and next a slave to work, directing his lieutenants in every part of the world with untiring energy. When Mr. Bennett comes to America, he is besieged by intriguers for his favor. During one of his brief visits to New York a prominent politician, whose ambitions led to the mayoralty, offered him a check for fifty thousand dollars for the support of the "Herald." "This check can be traced to me," said Mr. Bennett, looking him in the eye. "Then I'll get you the money," said the foolish politician, deceived by the calm bearing of the journalist. "Good!" said Mr. Bennett. Presently the politician returned with a roll of money. Mr. Ben­nett could no longer restrain himself. He tore the check in two, threw it in his vis­itor's face, and drove him from his pres­ence. Some years ago a New York syndicate cabled a message to Mr. Bennett, asking him if the "Herald" was for sale and what was the lowest price he would take. His answer was: "The Herald' is for sale - price, three cents daily, five cents on Sunday." 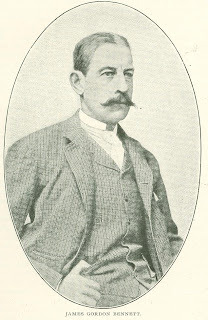 Had Mr. Bennett not been the owner of the "Herald," the service he has rendered to the cause of wholesome, legitimate sport would have established him as a notable man. He introduced polo to America; spent hundreds of thousands of dollars in leading the revival of coaching in France, abandoning the whip only after an almost fatal accident in 1893; organized interna­tional automobile races; built and sailed yachts, and in a hundred ways encouraged out-of-door, manly pastimes. His attitude to sea-sport is illustrated by the fact that he is always the licensed captain of his own yacht. Today he holds a government certificate as commander of his beautiful new vessel, the "Lysistrata," in some re­spects the finest steam-yacht afloat. And during all these years of travel and sport and adventure there has never been a day when every vital detail of the "Herald" was not controlled by its absent owner. It requires absolute genius to do that sort of thing successfully.